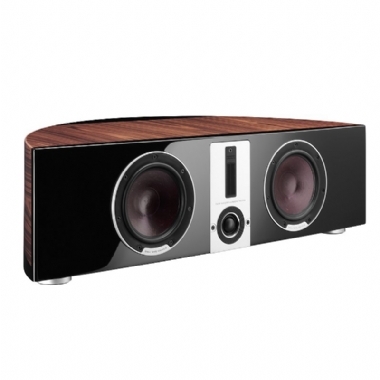 We have developed an uncompromising center speaker for all of you multi-channel fans - the DALI EPICON VOKAL. Incorporating 2 x 6½” woofers along with the hybrid tweeter module this speaker promises the same level of transparency and timbre matching with the rest of the series. EPICON VOKAL will match any of the three main speakers, and it will benefit any setup where the realism and realistic sound pressures are required. Common to all the EPICON speakers is that they work well in both 2.0, 2.1, 5.1 or other multichannel systems. 50% of the acoustic energy in a normal movie comes from the center channel. The EPICON VOKAL is up to the real challenge. Meticulous timbre matching and the same ability to render finer details exactly the way they were recorded is an EPICON trademark. Here, e.g. the effortless reproduction of human voices is what sets DALI EPICON VOKAL apart. The new innovative in-house developed Linear Drive Magnet System eliminates four distortion factors in the driver motor system. The individual parts of the magnet system close to the voice coil consist of advanced soft magnetic compound (SMC), which eliminates variation of flux strength in the magnet gap. The SMC material features linear magnetic properties throughout the frequency range and eliminates phase variation in the force generated within the motor system. Aluminum rings around the pole piece reduce and stabilize voice coil inductance, independent of excursion. This allows optimum conversion of voltage generated by the amplifier to current flowing through the voice coil. The center speaker also features the EPICON hybrid tweeter module with the new dome tweeter specially developed for the EPICON series. The dome as well as the ribbon sit in a common, solid, diecast aluminium base plate, each with their own enclosure to make sure that no resonances will reach the sensitive parts. Both tweeters are therefore well protected from any interference from within the cabinet.